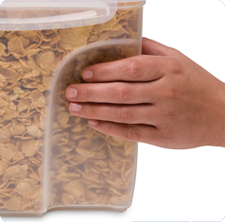 The Ultra•Seal™ 24.0 Cup Dry Food Container is ideal for storing items ranging from a family-sized box of cereal (24 oz size) to dry goods like 10 lbs of sugar, flour, pasta or rice. This dry food container features a color-coded matching system to help find the correct lid and base combination without rummaging through the cupboards in your home. The flip-top lid allows for easy dispensing of contents, and the clear base lets you easily see when it is time to refill. Also, an ergonomic handle in the base provides a comfortable surface to grip for natural pouring. 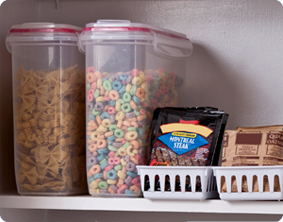 Ultra•Seal™ containers are freezer, microwave and dishwasher safe, as well as BPA-free and phthalate-free. 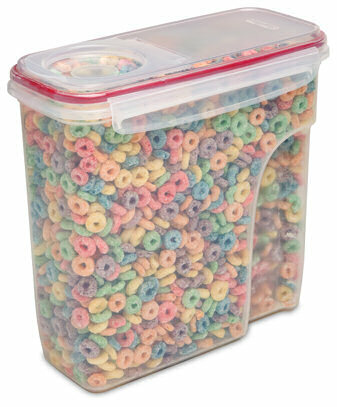 The overall dimensions of this item are 11" L x 5 1/8" W x 10 7/8" H.
Overall Assembled Size: 11" x 5 1/8" x 10 7/8"
Perfect size for storing a family-sized box of cereal. UltraSeal 24.0 Cup Dry Food Container is rated 1.9 out of 5 by 15. Rated 1 out of 5 by Jamimichele3 from Great if you don't want to use the top, otherwise two thumbs down I received the 4 & 6 qt Ultra-Seal Dry Food Storage containers for free from Sterilite. Right out of the box, I was unable to attach the lid to the 6 qt container as it wouldn't line up and the flaps would not click shut the 4 qt container was perfectly fine. I came to this site and saw that company feedback was to run them through the dishwasher and reattach the lid when the items were still warm. After doing this, my husband was able to get the lid to latch on the 6 qt. I have limited mobility in one of my wrists and still was unable to attach the lid. 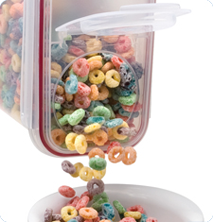 I let my family use the containers for storage of cereal. If you can get the lids to attach, they function as intended. The product looks nice when on a counter. 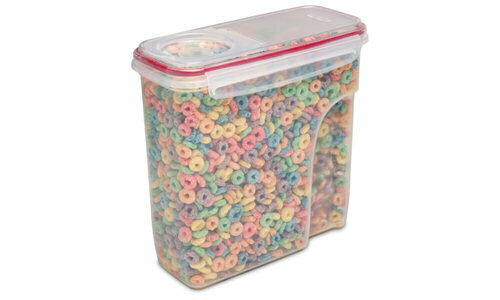 When you go to store them in a cabinet, the lips of the lid jut out and make the container wider to store. Perhaps this is so that there's room to stick your fingers in to grab the container, I'm not sure. However, they take up more space than leaving a cereal box in a cupboard. Due to them being wider, I had to temporarily relocate the cereal to another part of the pantry which was inconvenient. I would not recommend this product for anyone with decreased flexibility in the wrist. The lids are very finicky and take a lot of effort to put on. If someone was planning on purchasing this product, I'd recommend sticking with the smaller size and purchasing in a store to ensure you want to deal with an unusual lid like this. Rated 4 out of 5 by uwomom from Great storage container. I have 4 of these 24 cup containers. Had them for over a year. My family uses daily. i have no problem with this product. love them. I would love another 6 please. Rated 1 out of 5 by Hoosier from Lid will not snap shut. Same problem as everyone else! Lid will not snap shut. Same problem as everyone else! Will try the hot water tip. Do not buy these! Rated 1 out of 5 by clemensun from Terrible -- lid is worthless I love buying Sterilite products because they're made in my state. However, this product is terrible. The latches on the lid simply don't close, making it worthless. Rated 1 out of 5 by Does not work. from Do not buy this product it does not latch. I own two large bowls that latch on all four sides. The two bowls are great they hold liquid and can be turned upside down with no worries. Unfortunately the two new 24 cup dry good holders that I purchased at Target are complete junk. They only have two latches on the sides and the latches don't clip in, so opening the small lid from the top causes the large lid to open it all falls apart they are not airtight and do not seal well. Avoid this product.I can't find my receipt to return this junk so I'm stuck with it. Rated 1 out of 5 by Tina B from Great idea, poor execution I've been looking for quite some time for the perfect cereal container so when I found these at target I was thrilled. You can only imagine my disappointment when I got them home only to find that the side clips won't stay closed. You can snap them closed and literally stand there and watch them pop open. I'm VERY disappointed!! Sorry, Sterilite, but I think you dropped the ball on this one.